Thomas & Betts Releasable lashing cable tie in natural color, has nylon/polyamide 6.6 construction for added strength and durability. 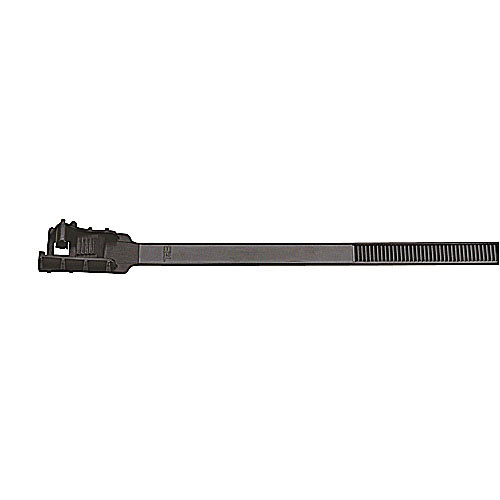 The 0.78-Inch lashing cable tie with double locking head, has a tensile strength of 200 lbs. It measures 0.5-Inch x 19.01-Inch. This cable tie has a bundle diameter ranging from 1.77 to 4.76-inches and withstands a temperature ranging from -40 to 80 deg C. It is suitable for indoor and outdoor applications. It is perfect for copper conductor cable, coaxial cable, fiber optic cable and inner duct in aerial applications. The lashing cable tie meets cULus, DFARS and E54523 standards.